Breathing deep, the breath catching in my lungs at altitude. I gave the trail ahead a quick glance before shifting my focus back to my pedal stroke. Engulfed in a thick mountain mist, the surroundings attempted to peek through cloud cover as we climbed. 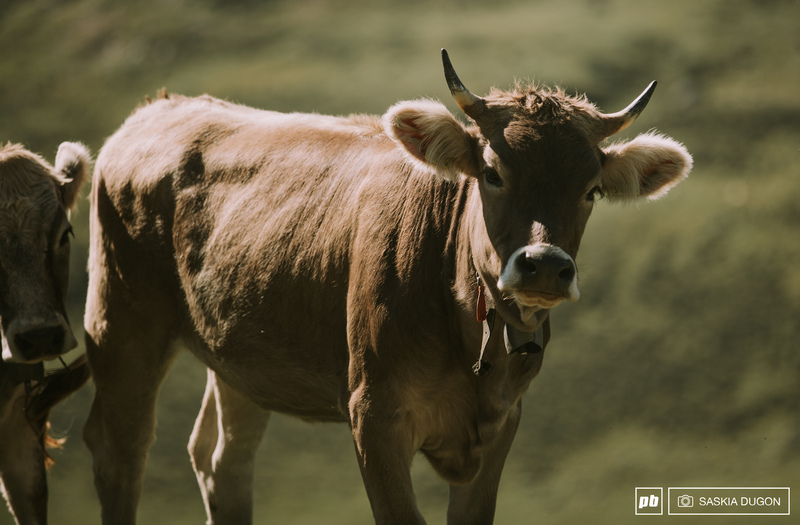 Here and there we could make out the vivid green of the trees, the lighter shades of the grass punctuated against the black, white and brown of the alpine cows, their bells a melody in the wind. Following in the wheel tracks of Tammy Donahugh, Sara Jarrell, Emily Horridge, the group, and our guide, Laura, I had no idea what lay ahead, but as the rain fell around me, lightly tapping on my jacket, I took a breath, adjusted my dropper and found the rhythm to drive me up the mountain, cold wind biting, the colourful kit worn by the other riders serving as beacons on the trail ahead. Climbing up the mountain into the mist. 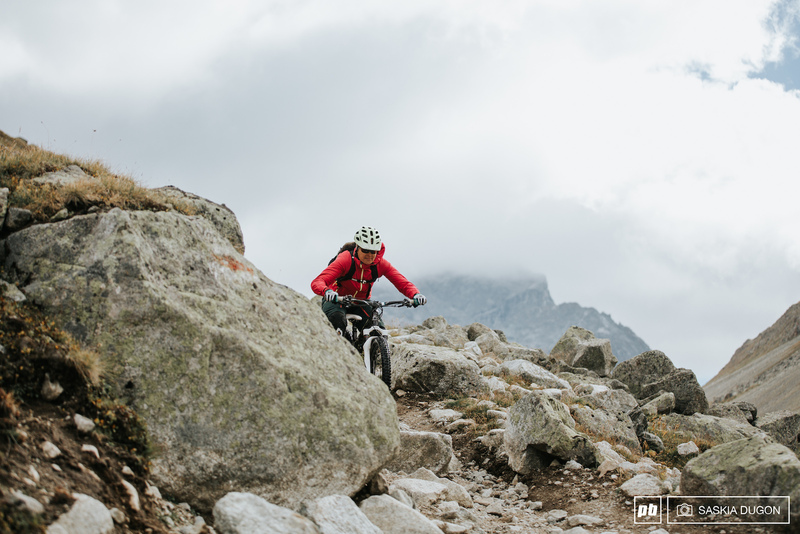 The great thing about mountain biking in a new destination is the thrill of the unknown. 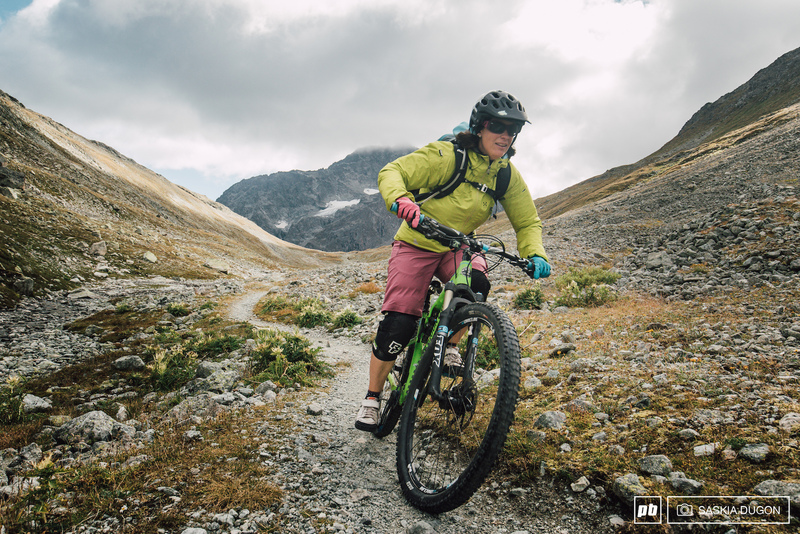 You rely on your guide, your skills and your bike as the singletrack unfolds before you. 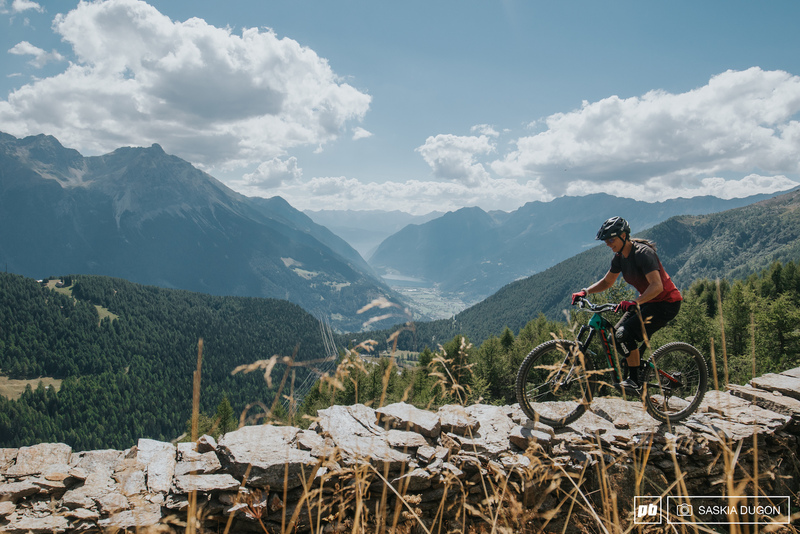 The downside - if it could be seen as such - to riding in new places, is not knowing where you’re going, not hitting something as you usually would and not having the fitness to enjoy it to the full. This is where I found myself on day one as I adjusted to the altitude, the mountain air creeping into my jacket as I hiked my bike up a steep section of trail. Climbing higher, I was treated to glimpses of the surroundings through the grey, the blueberries growing alongside the trail, a splash of colour against the gloom. 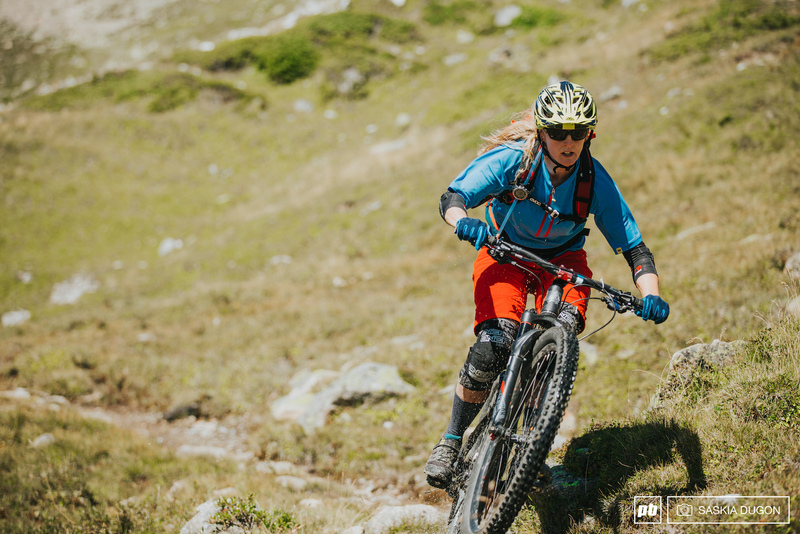 Receiving an invitation to attend the International Women’s Mountain Bike Week a few months prior, excitement filled my being. Adventure is a gift. 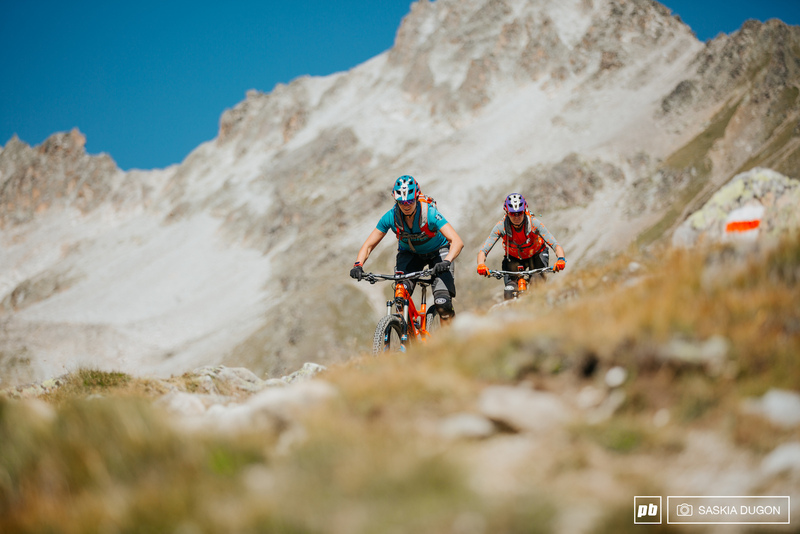 An adventure with like-minded women, riding bikes for a week in a beautiful part of the world? Count me in. From left to right: Sara, Lauren, Judith, Britta, and Tammy on Corviglia. St. Moritz is based in the Engadin, a high Alpine valley region in the eastern Swiss Alps, and is widely known as one of the world’s most glamorous and expensive ski resorts. 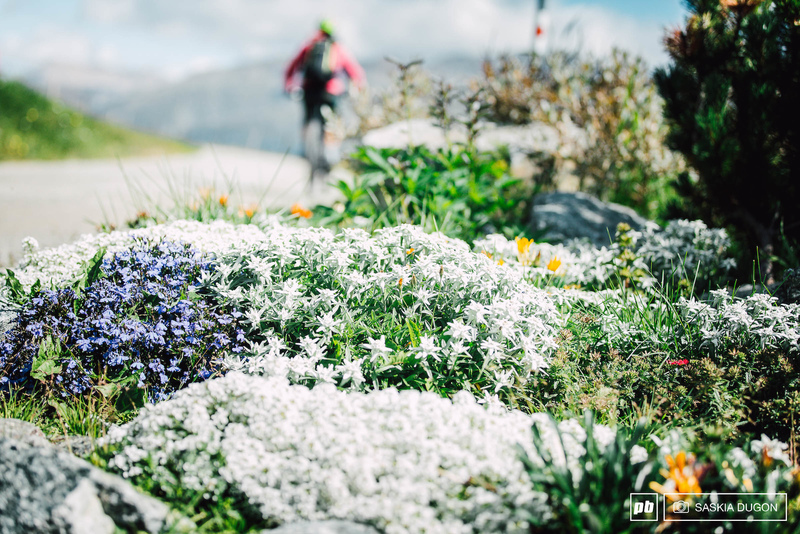 One of 12 alpine villages in the Engadin, St. Moritz has a great transport infrastructure with 13 mountain railways and cableways (five of which are bike friendly) as well a public transport network, which allows you to explore over 400km of trails in the region. The views in St.Moritz are incredible. Arriving in St. Moritz I was immediately drawn to the lakes as we drove to the hotel. The blue was almost ethereal, the colour changing in the light, from piercing turquoise to deep blue. 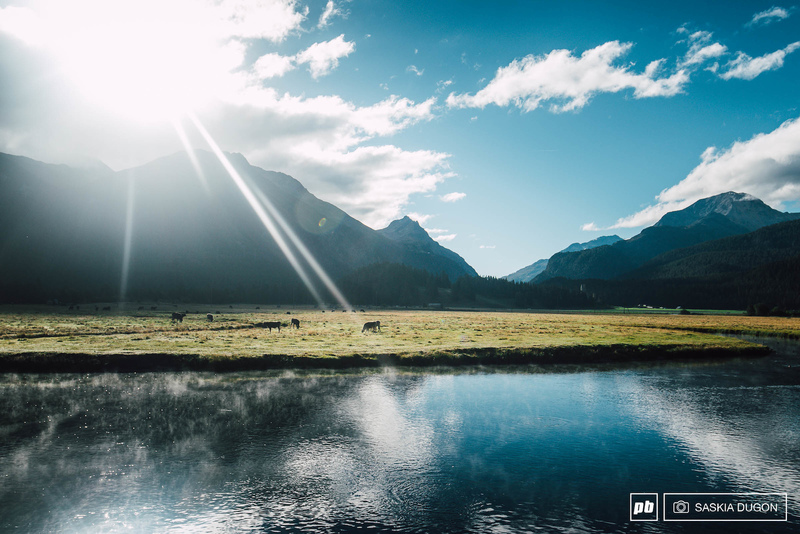 The colours blend as the sun reflects from the surface, a natural occurrence thanks to the minerals in the water and snowmelt from the surrounding mountains. In complete juxtaposition were the buildings, a sense of wealth exuding from them, a strange mix of alpine chalet, with a hint of Italian villa. The centre almost felt like it didn’t fit, an assortment of hotels and chalets in whites, yellows, peachy tones and dark wood stood out against the backdrop of the mountains. The view from the Lodge. Arriving at Bever lodge, one of the region's many bike hotels the evening before, I was immediately impressed with how well the hotel was thought out. Storing our bikes in the bike room in the basement, surrounded by the cool, grey concrete, it felt like a fortress below the hotel. That night we were served the first of many incredible meals, but day one was a particular highlight - being served a local dish, Engadine Capuns, a meat wrapped in chard leaves and served in a milky broth with cheese. Following the introductions, we discussed our roles in the industry and talked a little about ourselves. There were seven guests in total; Tammy Donahugh, Sara Jarrell, Daniela Michel, Annie Soderberg, Emily Horridge, Samantha Dugon, and myself. At Bever lodge, getting ready to ride. Britta, our host from Allegra Tourism. With dinner and introductions over, we headed to bed, excited for the riding to come. 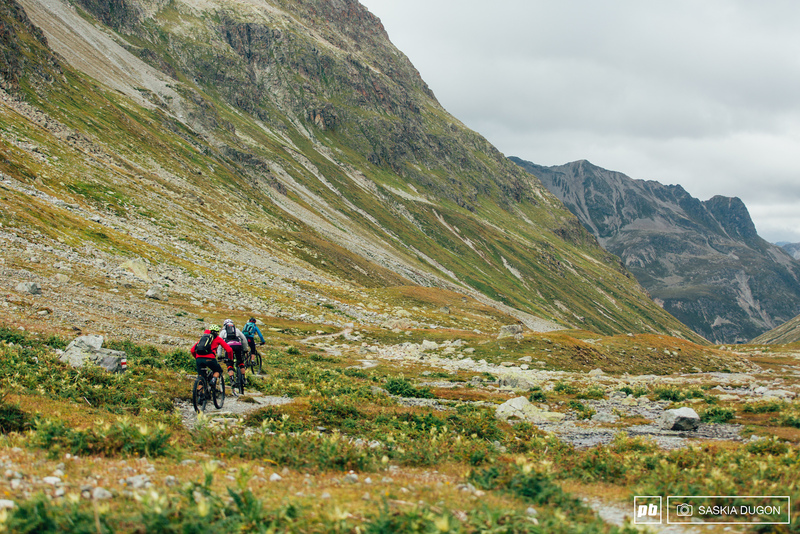 Day one began with a 15-mile ride from Bever lodge to the centre of St Moritz. Waking up tired to the gloom outside, the apprehension felt heavy in my stomach, only lifting thanks to the building excitement. The rain was due to ease in the afternoon and the promise of new trails lay in wait. As I got my wet weather gear on, we waited in the lobby, the faces of the other riders full of tepid enthusiasm. Everyone was eager to get out and ride, but the weather was hardly inspiring. 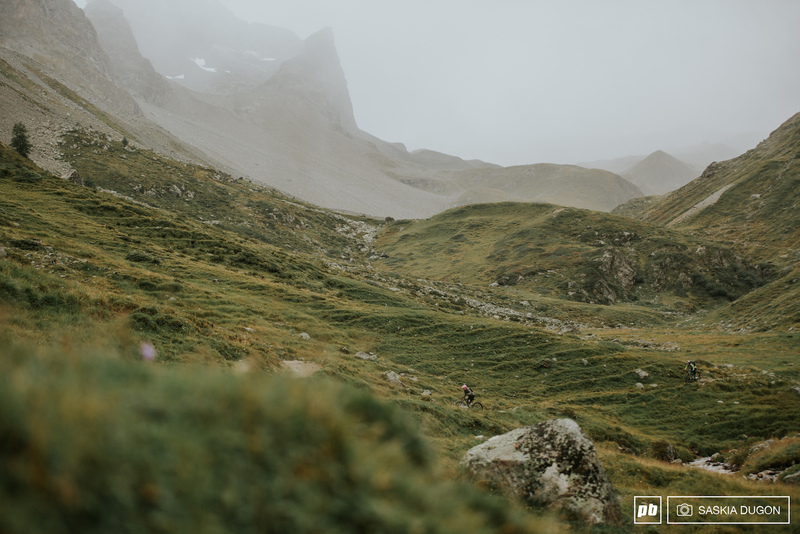 To start my legs felt like lead, I soon realised the week ahead would be quite the challenge due to the fact I spend most of my time chained to a laptop and not enough time pedalling..
A mountain hut, used by local farmers at certain times of the year. Getting the St.Moritz Bad Signal gondola up to the whiteout in the mountains, we had a 40-km ride ahead, a few climbs, some hike-a-bikes and a few downs, all taking in the views of what would have been the lakes if not for the bad weather. The exposed trails on the mountain on Via Engiadina were a challenge in the wet. We pushed up a steep incline before battling sniper rocks slick from the rain. 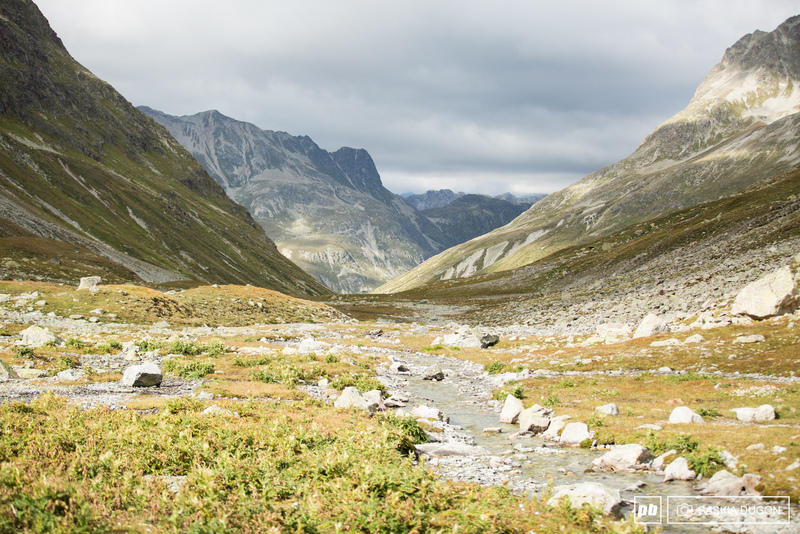 The trails twisted down the mountain to Silvaplana. 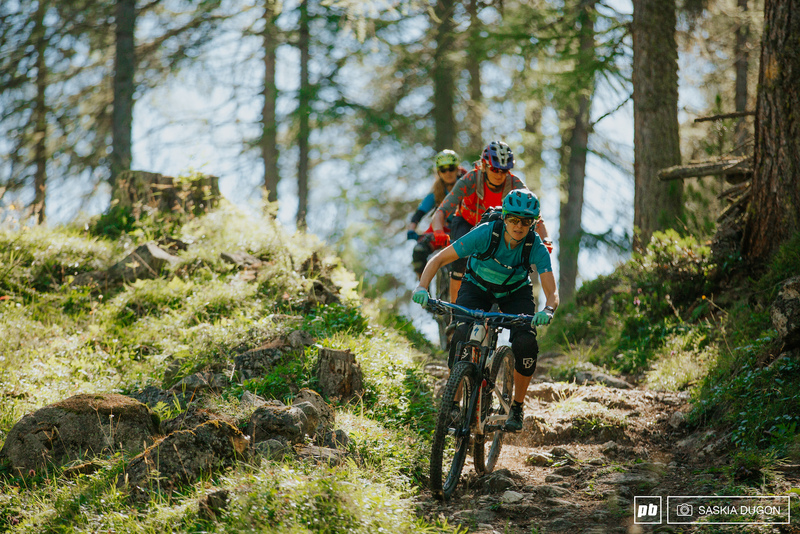 The natural trails were amazing, the singletrack snaking down the mountain, weaving through woodland and making the most of the natural terrain. 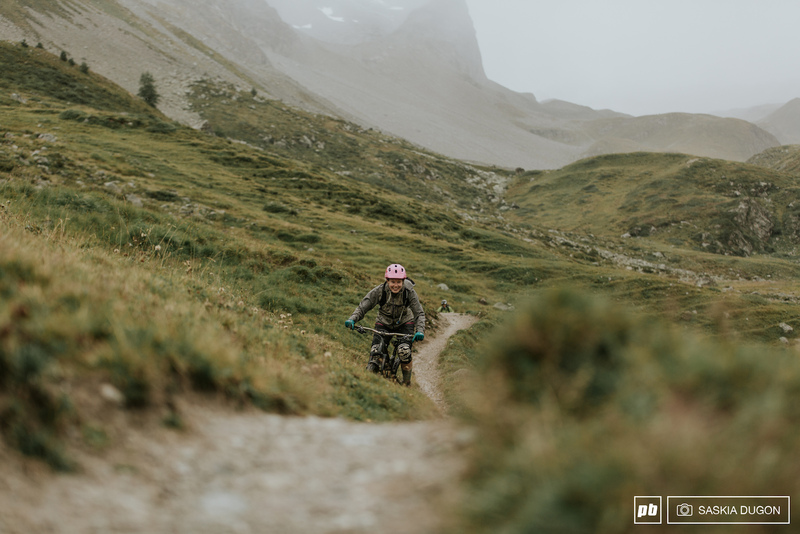 With barreled through the final technical sections, slipping over slick, brown mud and sketchy roots, before emerging onto the road and pedaling to the restaurant in Silvaplana, soaked and full of smiles. 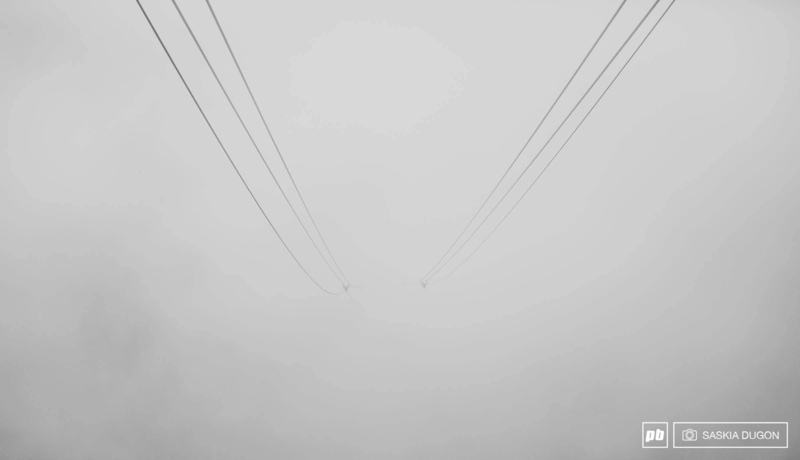 Ascending into the mist in the Bad Signal gondola. Following lunch, still wet from the morning’s ride, the group decided to play on the pump track to warm up before the skills session with Tammy. Despite the waterproofs, it was hard to get going, heading back, as we were, into the wind with damp riding gear and the wind chilling us to the bone. Tammy talked us all through simple skills to help improve our riding, demonstrating it a few times without overloading us with information. She explained the idea of loading, using momentum through the bike to flow through the techniques. Tammy heading back to Bever after the skills session. Heading back to the hotel on Alpine Bike route one, stomach full, legs heavier and body aching, the undulating trails in Stazerwald Forest were hard work. This wasn’t even endurance day and already I was convinced I was going to die come day three. Finally, arriving back at Bever lodge, I propped my bike at the wash stand and collapsed on the grass, a feeling of relief and joy flooding over me. 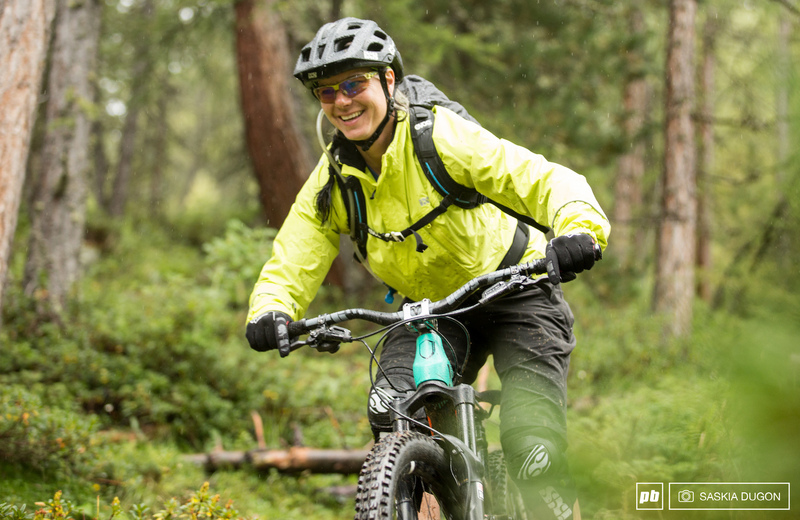 There’s nothing better than enjoying a day on the bike and getting back in one piece. Annie riding through Stazerwald Forest. 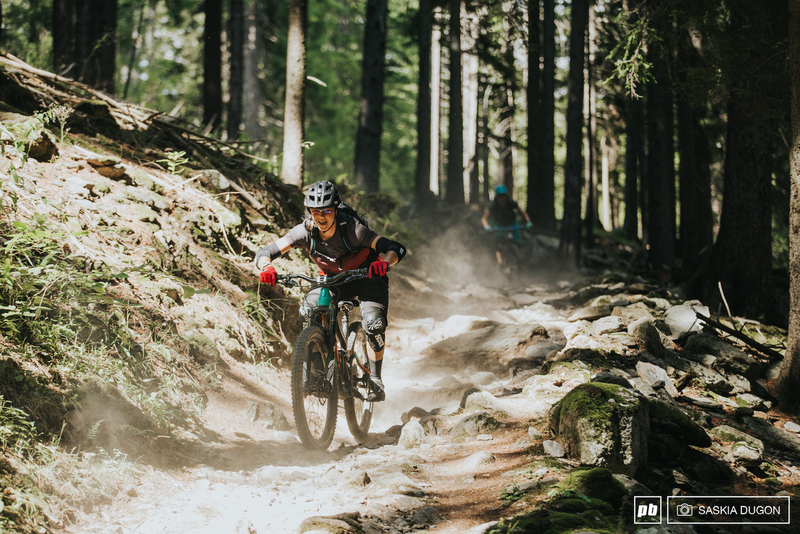 Enduro day saw us split into two groups, those wanting to complete the mountain railways challenge, and those wanting to take things at a more leisurely pace, but still getting to enjoy many of the same trails without rushing to get lifts and missing out a monster climb. The first group set off at 8am to catch the first lift with Laura, the second at 9:30 with guide, Judith. The aim was to ride the trails and meet for the final descent at the end of the day. Judith, our guest guide for enduro day. Taking the first lift was a little like being in a ghost town, our small group the only people at the Celerina lift station despite the fact the lifts stay open until late October. We took the lift up to Marguns before heading down to Chantarella and getting the funicular up to Corviglia, before getting the gondola to the top of the Piz Nair. 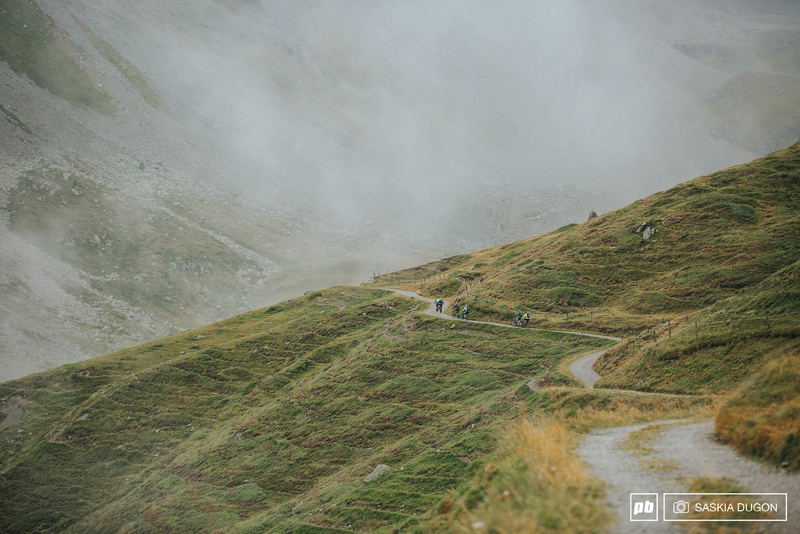 At his height, 3,057 metres up, the views were panoramic, the alpine villages meshing together, the lakes glowing in the distance as the clouds danced above, a frenzy in the wind. At the top of Piz Nair. The first trail of the day was intense. 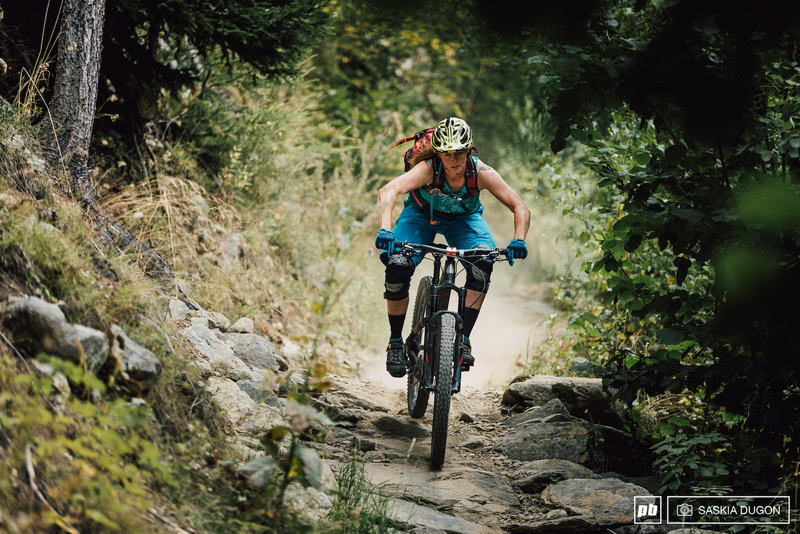 My heart hammered in my chest as I dropped in on a skinny, off-camber singletrack that clung to the steep mountainside. Concentrating hard, taking deep breaths to keep steady, I navigated my way towards the bottom over the Fuorcla Schlattain, telling myself not to look down as the shale and loose rock slid beneath my tyres. The trail continued down through off-camber, tight switchbacks and loose rock. I found myself half scared to death but grinning like a lunatic, the unknown an exhilarating feeling as we weaved our way through the black, grey and faded orange; the mountains like a sci-fi moonscape against the blue skies. The surroundings like a moonscape. 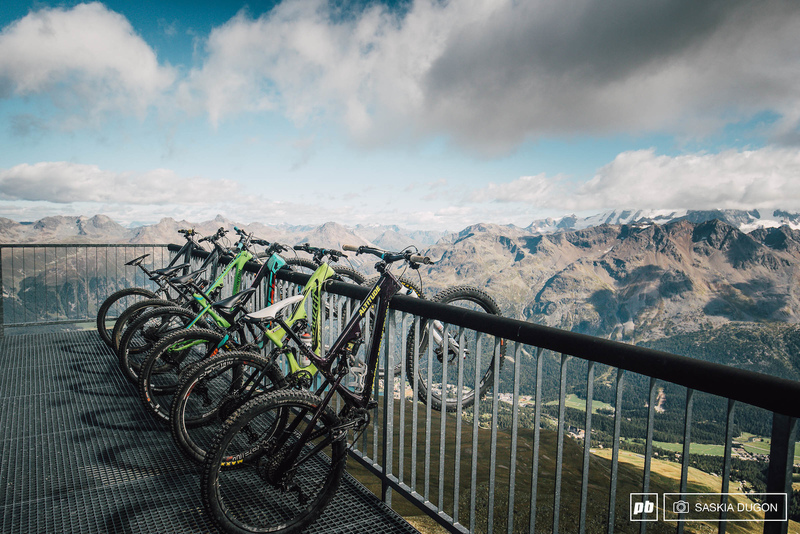 Next up was one of three flow trails, built only four years ago, St Moritz has invested a lot of time, money and effort into developing both their trails and mountain bike infrastructure, the flow trails only part of the recent development the region has invested in, with the local community, tourism board and the lift company working together to fund, plan and invest in the trails on offer. The Corviglia flowtrail was incredible fun; twisty berms, pump sections, little jumps, the whole thing flowed from top to bottom. Starting from the Corviglia top station, the trail winds down over 3.7km ending up at the Chantarella. Heading down the flow trail overlooking the lakes. 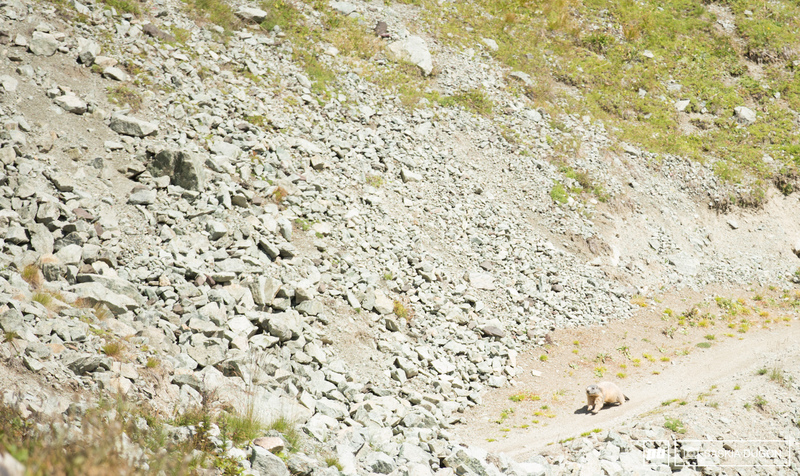 We headed up again and came down the WM flow trail, finding a spot for lunch beside the trail overlooking St. Moritz; marmots scuttling between the rocks as we ate. Marmots are quite brave, though not very subtle. 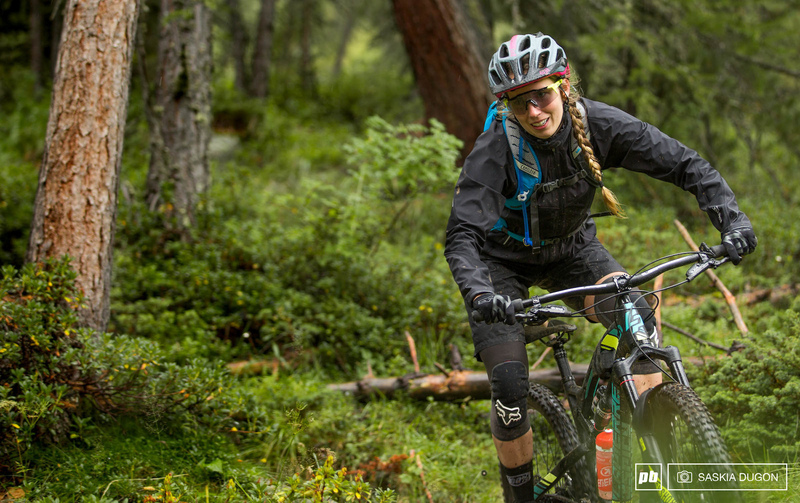 From there we crossed over to the Foppettas Trail, the third and final flow trail riding down to the valley and back to the Signal gondola. Switching straight to the Piz Nair lift, we met the other group before descending down the Val Bever for our last downhill of the day. The valley was expansive. Rocky trails with multiple lines gave way to lush green meadow, followed by tight switchbacks that led us past a waterfall to, finally, a fast and loose fire road into the village of Bever and back to the hotel. I really liked the first part, the shaly steep stuff and the fact we got to do everything, we got to do rocky bits and smooth bits, it was a good diverse day. - Tammy Donahugh. We finished the day with dinner in an old gondola called 'Alto Bar' on Chantarella, treated to more delicious food and wine before listening to the Gehrig twins talk about their careers, racing and how it all got started. 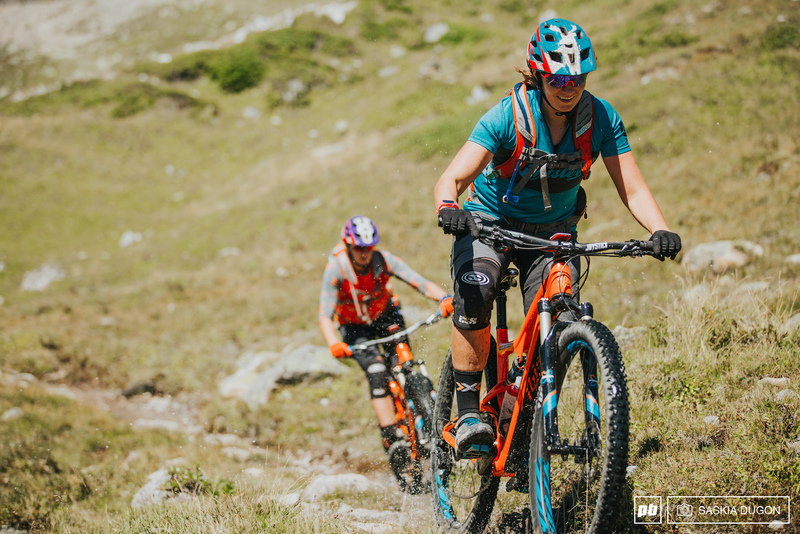 The Gehrig twins, two of the fastest women in enduro. We were always doing competitive sports as we grew up so it was natural for us to pick it up and do races straight away. It started with our brother, he was a professional junior mountain biker. 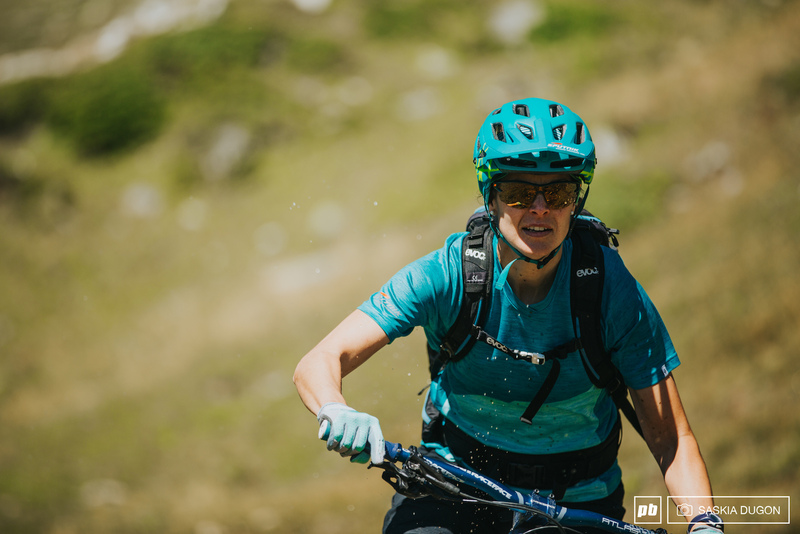 He was pretty successful and competed at the World Champs and that was the first time we were confronted by a downhill race and we were totally stoked about the buzzing atmosphere and we were like, yeah this is what we want to do!- Anita and Caro. To say I was dreading endurance day would be an understatement. Every muscle in my body ached. I was frustrated too. Frustrated that I wasn’t as fit as I would have liked and knowing that I would struggle with the ride ahead. But there’s a silver lining to every cloud, and mine came in the offer of a shuttle up the long, steep mountain road the rest of the group had to ride. I loaded my bike onto the car along with Sam and Tammy’s. 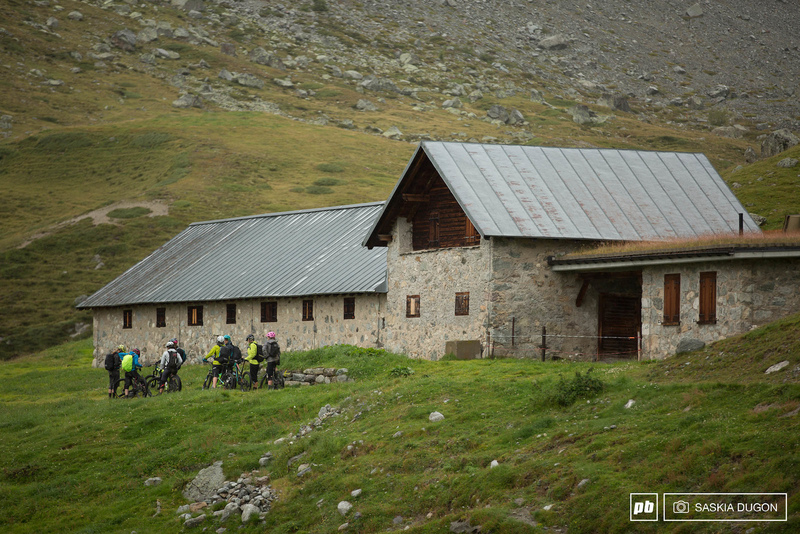 We would be going on ahead and would meet everyone at the Chamanna des-cha mountain hut for lunch. Heading off the road to the trail we began the trek to the mountain hut. Halfway up the trail we noticed hunters sitting upon the hill, their clothing camouflaged, blending with the grass. We got off to push up a particularly tricky bit of trail. Suddenly, from above the brow of the hill, came the sound of thundering hooves. Shortly afterwards a herd of cows approached, galloping down the trail in an almost drunken fashion. 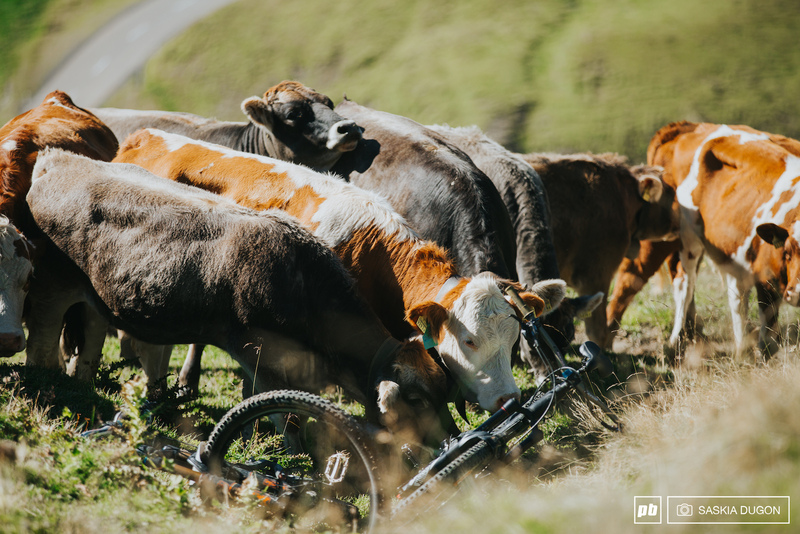 Rather than stay in the way, we pushed up the grass bank, set our bikes down and waited for the cows to go past – instead, they didn’t, they formed a semi-circle around us, watching us as if waiting for a performance. Curious creatures by nature, their big eyes stared back at us as they approached cautiously. Closing in on us, they turned their attention to the bikes and before long our rides had been sniffed, licked and given a full inspection by some of the braver bovines. Rather than risk the bikes getting trampled, I approached the cows as cautiously as they had us. Reaching my hand out, I crept forward only to be greeted by a grey, sticky tongue. I reached down to get the bikes and slowly passed them up to Tammy. Keeping my eyes on the cows the whole time, we were soon on our way to the hut. The fun began once we reached the top of the hill. Squeezing through the gate onto the trail, we passed two hikers before beginning the traverse. Like a small doll house in the distance, the red shutters illuminated against the dark mountains. I felt my heart rate rise, heart pounding in my chest as the adrenaline coursed. The singletrack snug against the mountain, either side a sheer slope. The only thing to do was focus on looking ahead - definitely not down. Further along the trail we came across various sculptures of sorts – in all shapes and sizes, rocks balanced on top of one another creating little statues on either side of the trail. Much to my relief - full from the amazing spaghetti dish at the alpine hut as we basked in the sun - the rest of the day was due to be all downhill. Laura, our guide, called it ‘alpine flow trail'. This was something I did have energy for. Starting from the hut, the trail opened up below us. 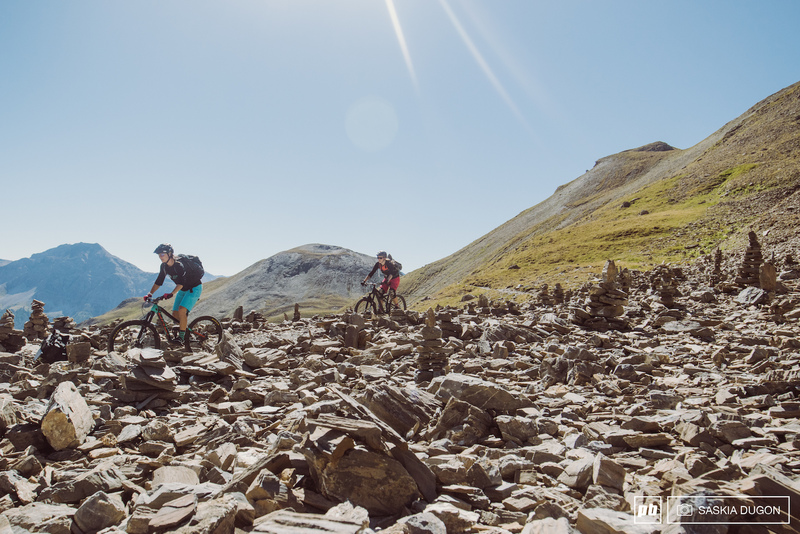 It was a technical descent full of loose rocks, tight corners and narrow singletrack. I followed Sam, laughing behind her as we smashed down the trail, the rocks pinging off our tyres. The next thing I knew I was on the floor, flung over the handlebars, my pedal had connected with a rock and I hit the ground before I could do anything about it. Dusting myself off, a quick check of the bike and we set off again. 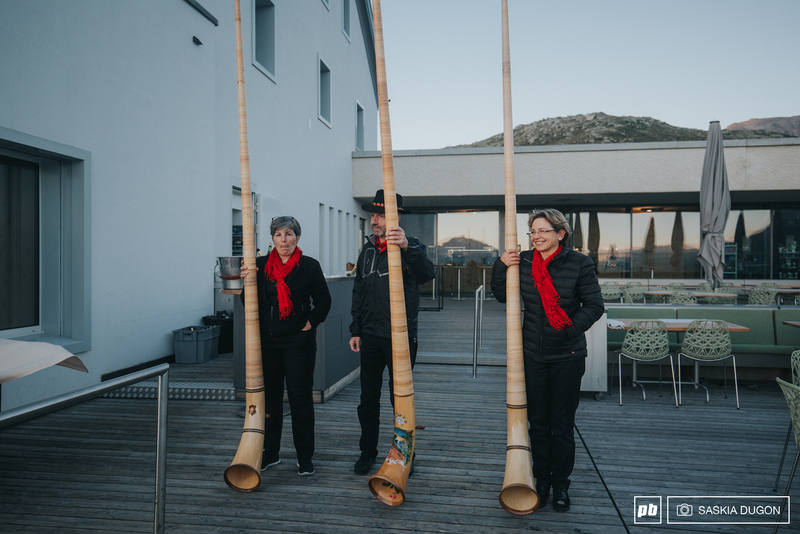 That night we were heading up to The Romantik Hotel on Muottas Muragl, a plus-energy hotel at 2454m for an Alphorn Apéritif and dinner. Dropping into the trail from the mountain hut. 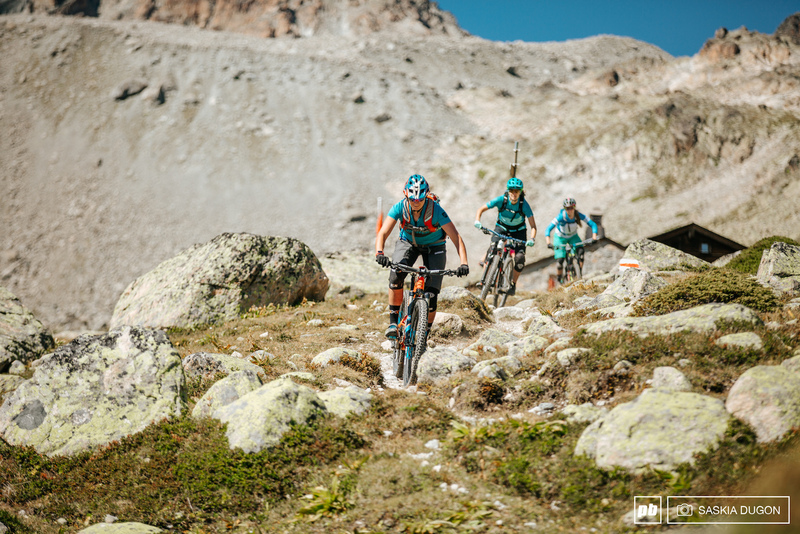 It was absolutely great to connect with ladies from different parts of the industry while riding together on the amazing trails in Engadin. - Anita Gehrig. Riding down the trail to Bever. 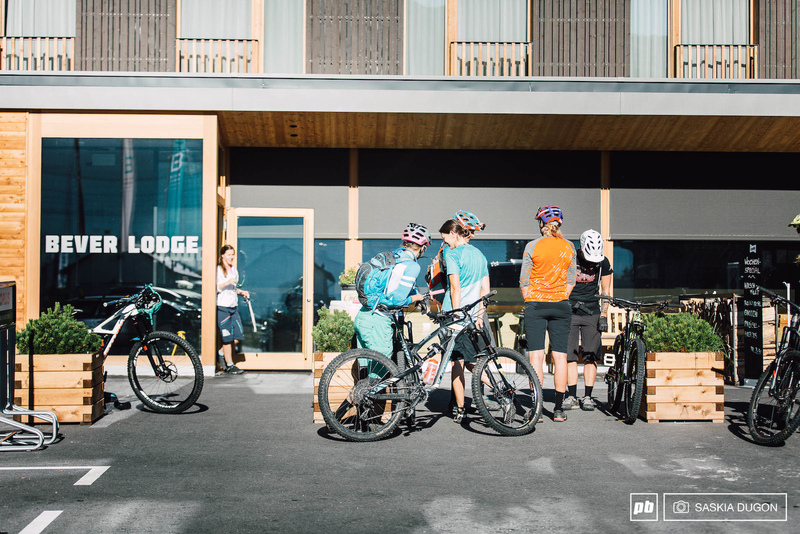 Arriving back at the Bever lodge, we picked up our belongings and transferred to Hotel Palü, another bike hotel in the Engadin. Unpacking and heading down to the lobby, Sara gave us a talk about her job, allowing us to ask any mechanical questions we had. That evening we travelled up on the funicular to the Romantik Hotel, the whole of St Moritz coming into view on the journey. It was breath-taking: the setting sun on the lakes and the orange sky melting into dusk. The mountain panorama was incredible; the fact that this view was accompanied by the sounds of an alpine horn trio playing for us made it even more so. I wish I could have bottled that moment, but maybe I didn't need to. I know it's something I'll never forget. Gravity day, a day I had been looking forward to the entire week. From Pontresina a few people took the public bus that would bring them over the border directly to Livigno. The public buses have a bike rack, and will even accommodate large groups and equip a trailer if needed. A few of us drove, including myself. The journey took around 40 minutes and proved a painless drive through well-maintained mountain roads, even taking in the views of the Palü Glacier on the way. Emily showing off her skills, getting sideways. 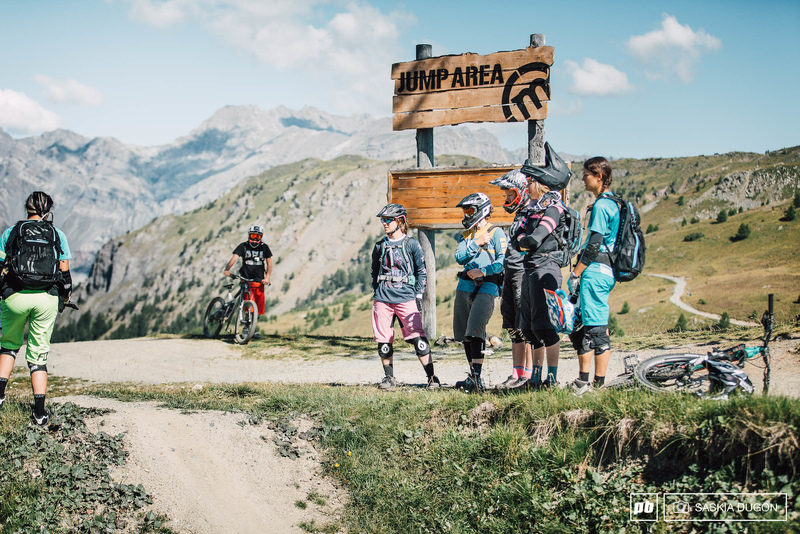 After scoping the trails, we met at the jump area where Tammy would once again shared her expertise and helped us get our jumps dialled. With three lines, various features and different-sized jumps, she talked us through technique, demonstrating before letting us practice. Everyone soon got into it, hitting the jumps and working through with Tammy’s guidance. Tammy talking us through jumping technique. After lunch in the hot sun, fatigued from the week we’d had, a few people decided to get ready to shuttle back home whilst a few of us wanted to stay and drive back later. Unfortunately my day was cut short, I went too high in a berm, washing out and flinging myself into a bank. Feeling a bit dazed, I sat the last few runs out as the guys had a few more laps. Sara shared her mechanical expertise with us. Back in the hotel that evening, the group had dinner before heading to a workshop held by the tourism board. 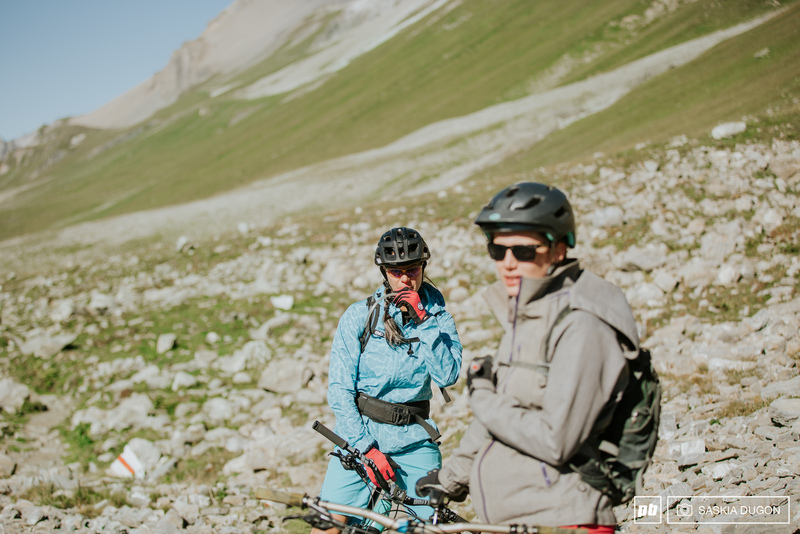 Discussing their plan for the next few years, Britta and the team told us St. Moritz has a mountain bike plan in place. We have a lot of trails up the Corviglia, we have five different cable cars. 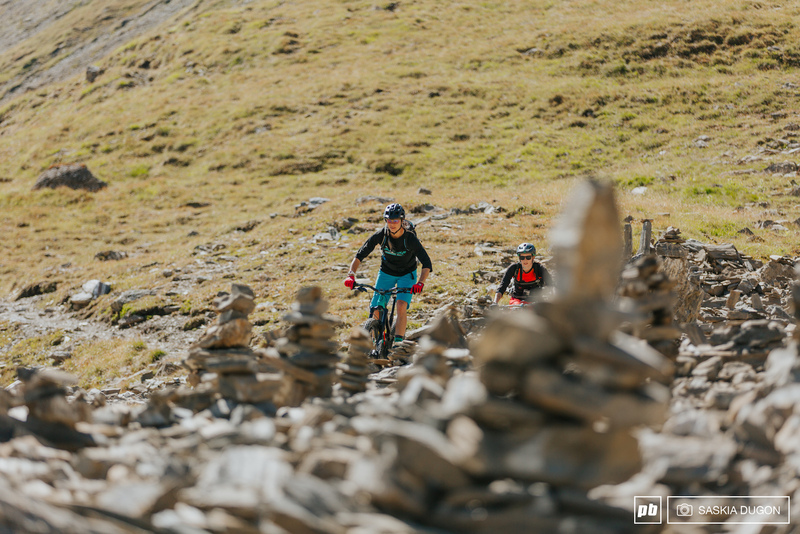 Last summer we had a lot more mountain bikers, so we changed things to accommodate that.- Nadine Simon, Engadin St.Moritz Mountains AG. 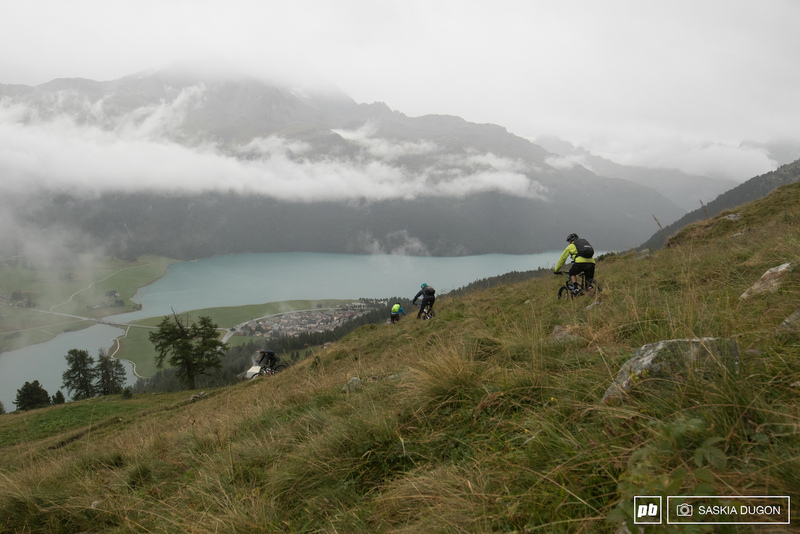 St. Moritz are doing all they can to improve the mountain bike infrastructure. Day five was bittersweet. It had been a long week, full of new memories, new experiences, and amazing new people. I, like many of the others was feeling it. 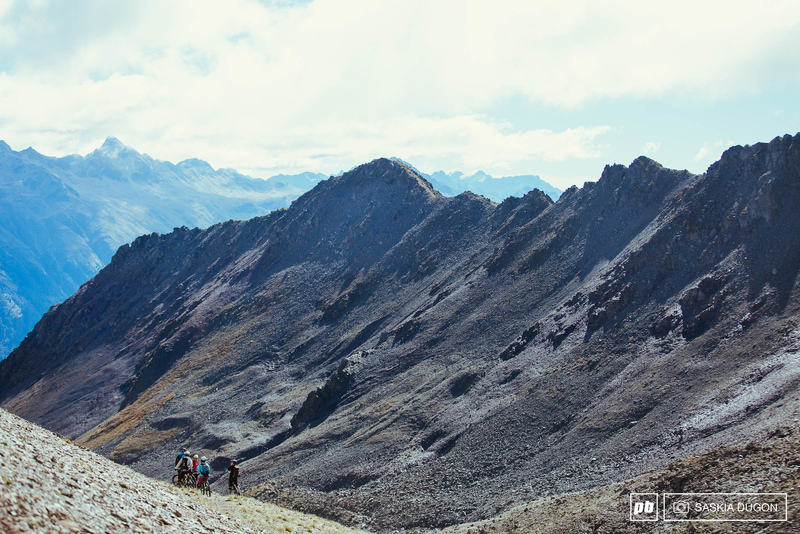 We'd just experienced days packed to the brim with activity, long rides and late dinners. Our days were full and our bodies now craved rest. With the last day ahead of us, once again we split into groups, some of us opting to pedal to a train stop further down the line, others wanting to hop on the train from town and pedal to the lunch stop. From our stop, we rode a trail that leads you along the Lago Bianco down to Alp Grüm to our lunch stop, the Belvedere. The climb wasn’t particularly hard. 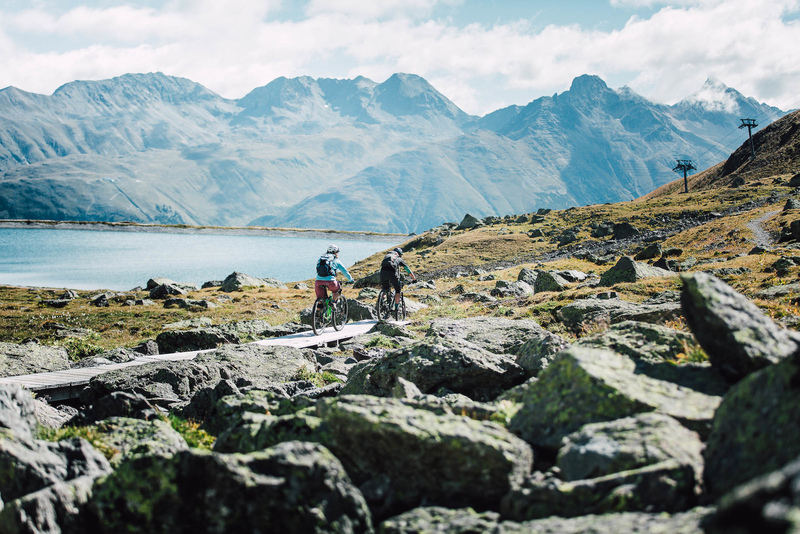 Riding alongside the lake, we took on a steady pace, taking in the surroundings. We rode down a deep gully to the valley floor with the sun beating down. We weaved in and out of hikers making their way along the trail, greeting them as we passed. I don’t think anything could have prepared me for the view. The Palü Glacier stood almost proud on the opposite mountain, the ice melt cascading down the side in a number of crystal-white waterfalls, the roar a distant echo. But with beauty comes heartbreak. We learned that in the last five years alone the glacier had receded more than it had in a long time, creeping further and further up the mountain. That knowledge filled me with a sadness. Perhaps soon it will be gone and many won’t get to see what I had. Fixing a puncture next to the track. The day just got better. The trails were something else. Darting round blind corners, riding blind down techy rock sections, dust flying up in front of me. Breathing heavy, I could feel the grin spread across my face, every muscle aching as I picked my lines. Precision was key to maintaining speed as we darted down, crossing the railway track several times as we went. I could feel myself getting lazy, my bike clunking, instead of flowing, over the terrain. Before long came the tell-tale noise of puncture-inducing rock. Traction started to disappear and I knew I had a flat. After some trailside assistance from Sara, we were soon on the way again. Suddenly Poschiavo came into view, but the trails weren’t over yet. More singletrack awaited. After 1,300 meters of descending, we reached Poschiavo with enough time for gelato before catching the train back. We enjoyed our treat in the village. 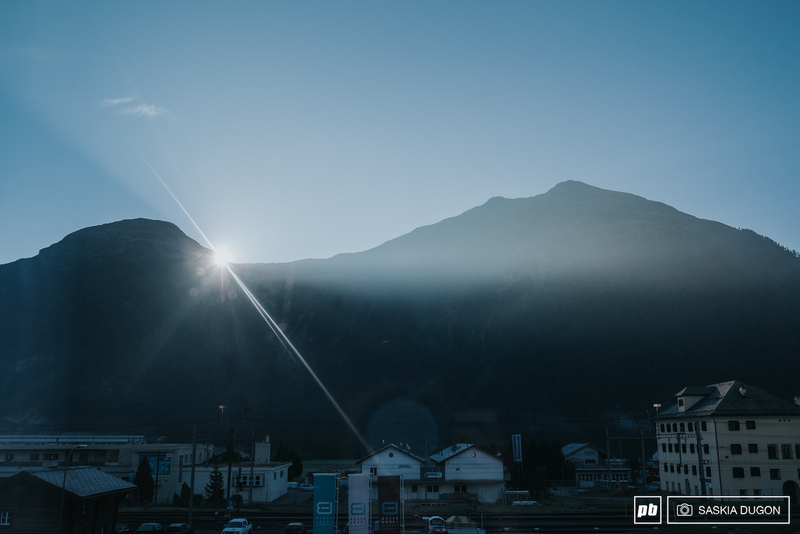 Quintessentially Swiss with a hint of Italy, Poschiavo is often referred to as "little Italy". Many of the inhabitants speak the language given the town's proximity to the Italian border. Tammy testing her balance, Poschiavo in the distance. Boarding the train back to the pass, we got to take in the views so many people take the journey for: vast, green valleys, mountain tunnels and incredible landscapes. 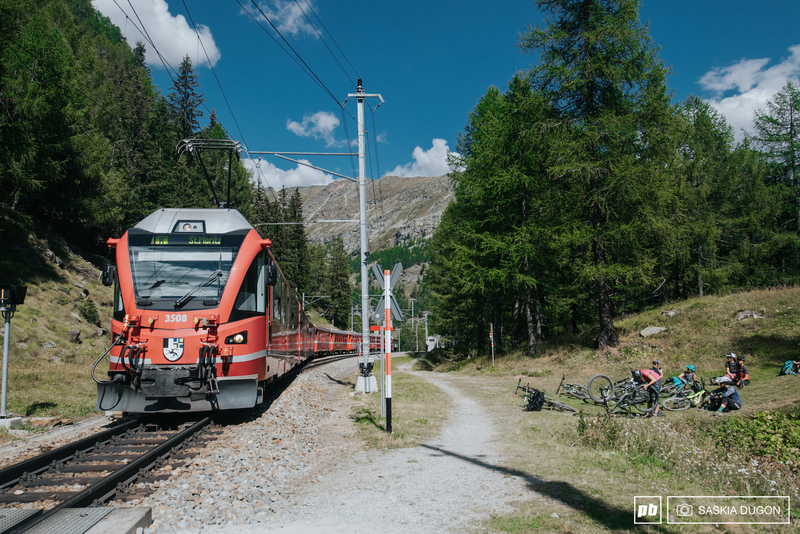 The Bernina Express connects Chur in Switzerland to Tirano in Italy through the Engadin Alps, even crossing through the World Heritage site. The trains have ample bike facilities on board. 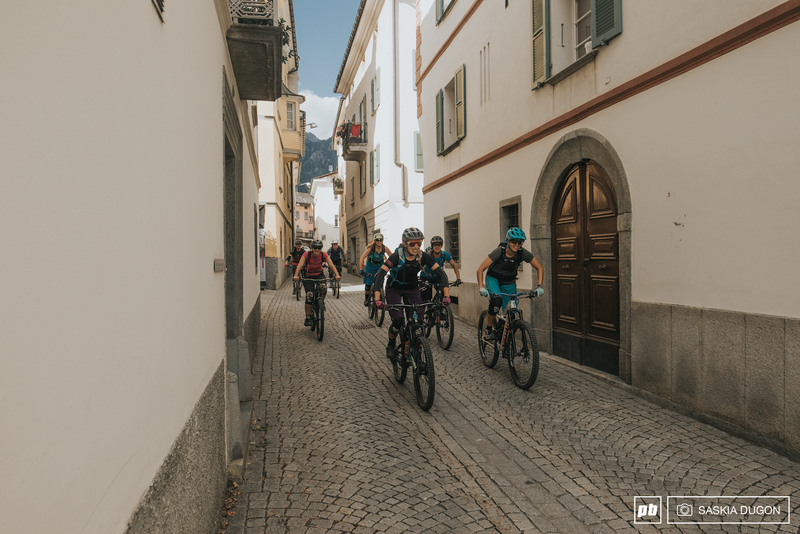 We all opted to get off the train a few stops before the hotel for one last ride, taking some singletrack back to Pontresina. Daniela, focused on the trail ahead. 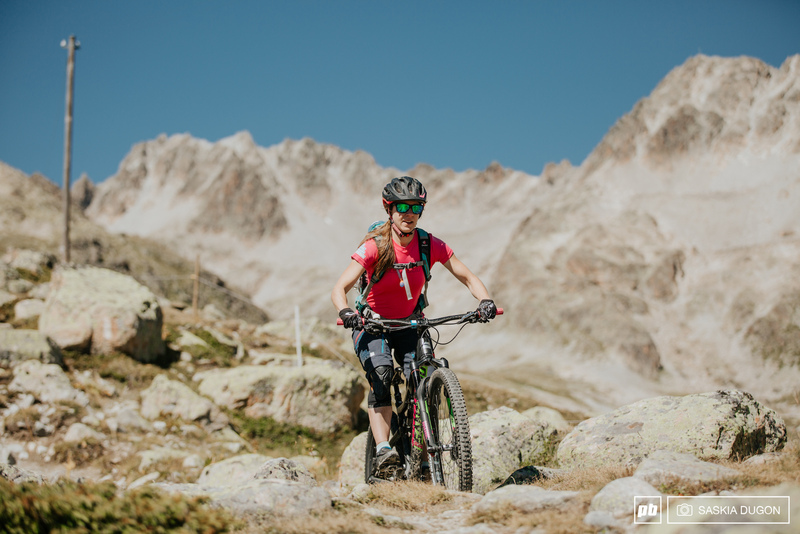 International Women’s Mountain Bike Week was an incredible experience. I gained new contacts and friends, challenged myself as a rider on so many diverse trails, visited a new area and perhaps most importantly, spent some quality time on my bike. 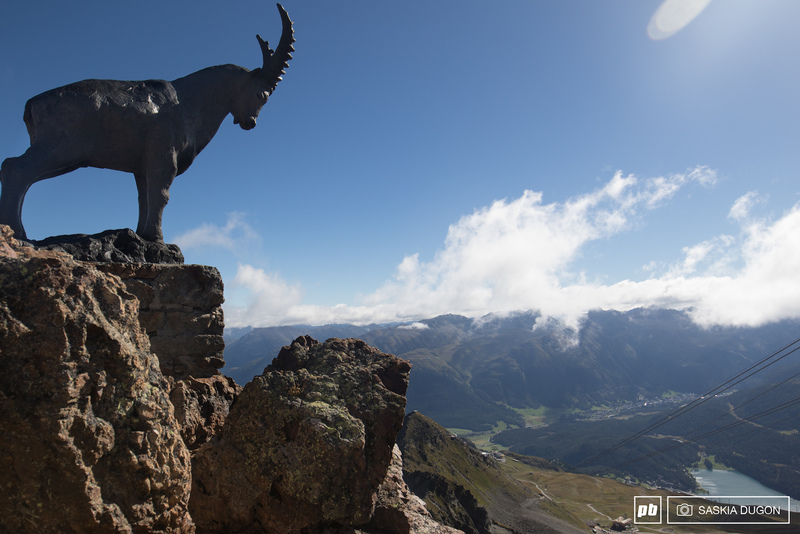 St Moritz is well-equipped and forward thinking when it comes to mountain bikers. They see riders as an asset, something to invest in for the future. They are working within their community to plan, create and implement a better infrastructure as well as working with other tourism boards to create a strong network. 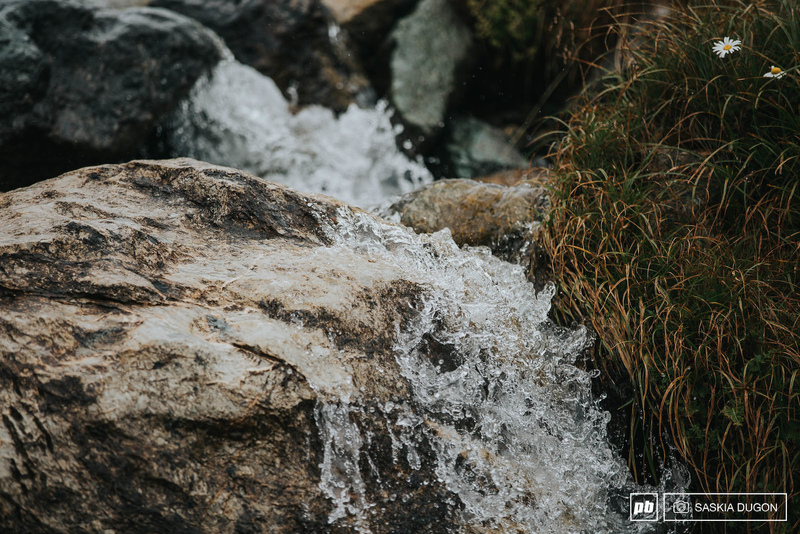 There are so many trails to explore, so much I didn’t have space to mention, but two things are certain – I will go back and I’ll never forget this trip. 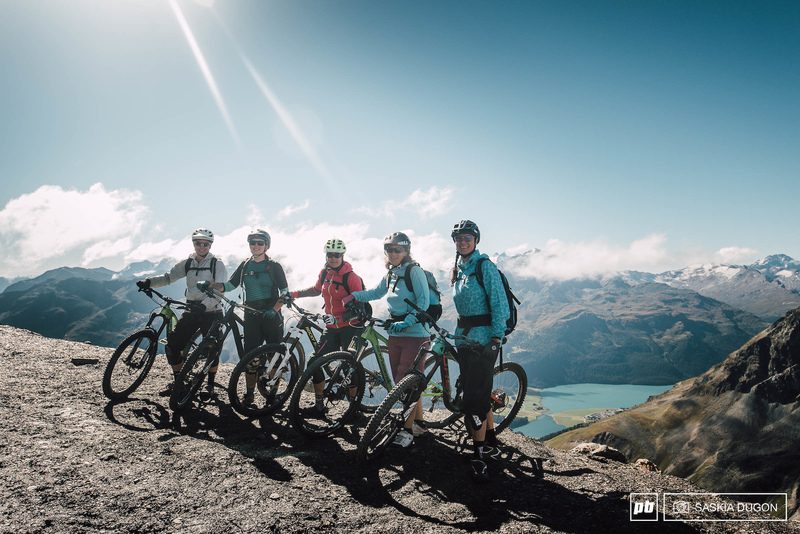 - 7 nights hotel accommodation in a mountain bike-friendly hotel including breakfast. - Free use of the mountain railways and cableways in the Upper Engadin. 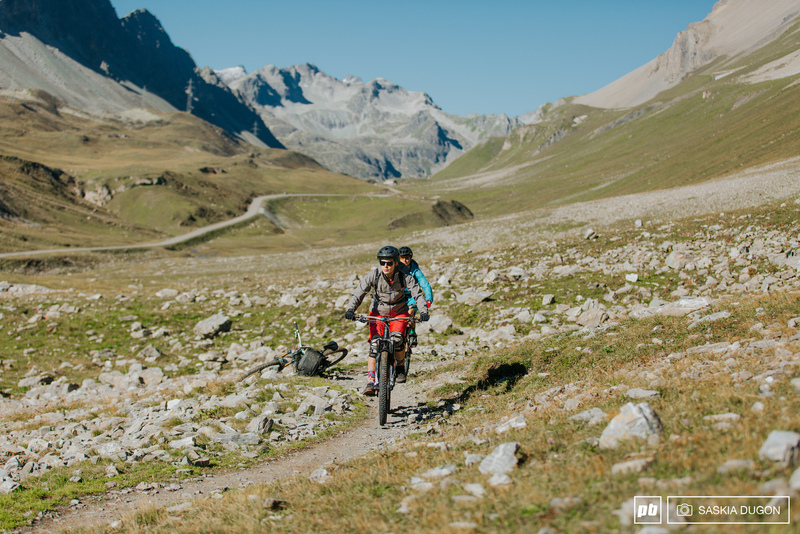 - 7 days mountain bike transport on the Signal, Chantarella/Corviglia, Marguns, and Piz Nair mountain railways. - At selected hotels free use of the public transport in the Upper Engadin. 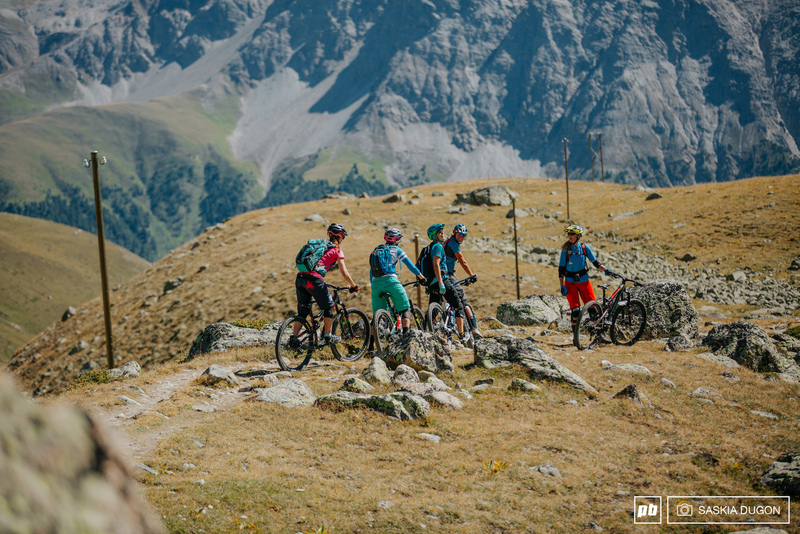 - Additional services at the special mountain-bike-friendly hotels. *Subject to change for 2017. 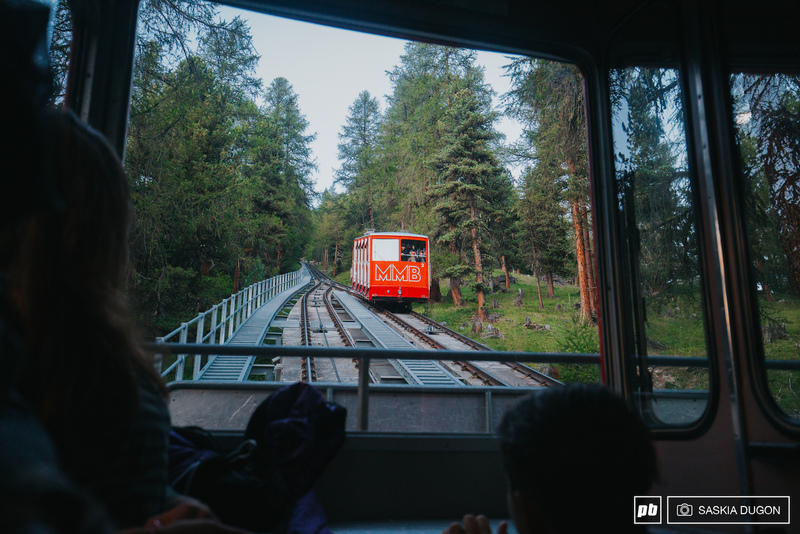 Over 100 hotels and around 150 holiday apartments offer the 'Mountain Railways included', that means guests staying more than one night in a participating hotel or holiday apartment enjoy free mountain railway transport. Most of the hotels and some holiday apartments include free use of the public transport. You know what I like most about this? In nearly every riding picture where you can see their faces, they are smiling. I love the universal joy that mountain biking brings to all, and how that almost always translates to kindness within the community. It's what keeps me on the bike season after season. It's what happens when you don't have to climb. Smiles for miles when I see a chairlift. Excellent write-up @laurenjenkins! Sounds like it was an epic trip and I'd love to be able to ride Moritz some day. Thanks for all of the useful info! On a side note and I'm sure you get this a lot, but before dropping into a gnarly section like on Mountain Railways, while all the girls are discussing their plan of attack, do you interrupt with a "All right, thumbs up, let's do this... LAAUREEENNNNN JENKINS!!!" and proceed to bomb down the trail? I had the privilege to live in the beautiful country of Switzerland for a few years. At the time I had not discovered my love for mountain biking and looking at these photos makes me want to go back and ride so bad! Such an amazing country with the most beautiful scenery in the world! Thanks for sharing the experience! There is a really nice campsite at the Lake in Silvaplana. Way cheaper and they offer nearly everything (heated room for drying clothes ......) you could ask for. There you can go biking in the morning and windsurfing in the afternoon. Really beautiful place to stay. The nights can be cold in the summer as well. It usually snows once a month even in summer. Indeed, thats where I camped out in my van a few years back. Such a nice spot by the lake. and yes, the nights can get really cold, and some days get really windy too, which is why the lake is so popular with kiteboarders. 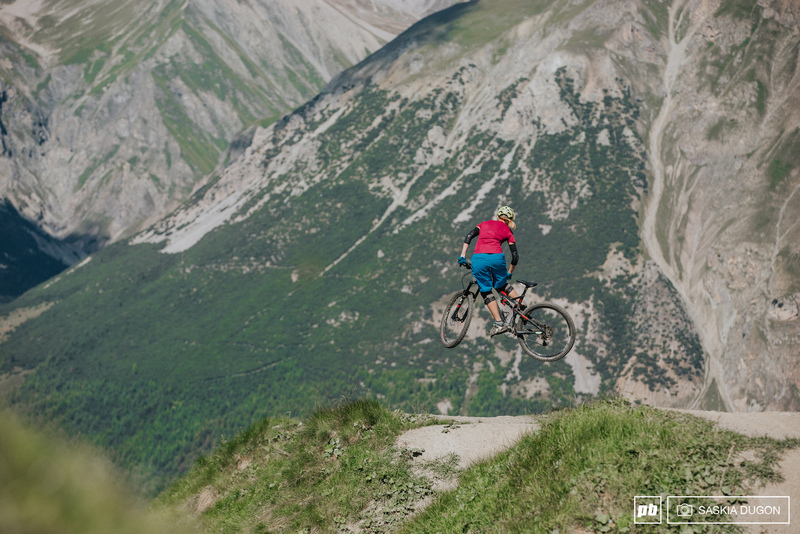 Also, Lenzerheide and Livigno bike parks aren't too far away, all worth a visit too. You know what, that's reasonable money actually. Knowing St Moritz' winter season prices I was expecting about three times that. 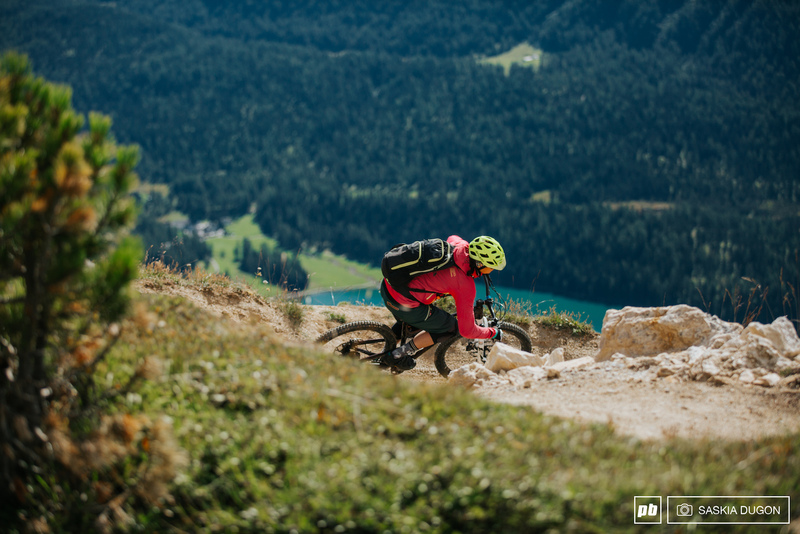 Only problem with going on holiday there is that it's in Engadin, I'd be too busy gorging on the food to get any riding done, I'd double in weight! If you plan to stay for longer, they have some good packages where you combine different services for a better price, but otherwise Switzerland is ffffffuuuuuuuuuucking expensive (at least compared to Germany and Austria), I visited it in September and the prices were comparable to Norway, I remember paying 2.20 GBP for a single croissant in a supermarket and saw a frozen pizza for 5.50 GBP. @laurenjenkins Thanks for doing this writeup. I just moved to Geneva Switzerland and will add this to my list of destinations to ride. Are there any good websites for getting plugged into ride events like these ahead of time (obviously not a girls-only ride)? I always seem to find out about these really rad events in Switzerland AFTER they happen. Nevertheless, it's great to have a new destination on the list. @motowhip: word! Thanks for posting that. wow, I'm super surprised that it's not costing an arm and a leg. I figured with it being in Switzerland it'd be mega bucks. The calculation is missing the costs for food, which are usually pretty high. @jmartinbiking: I know what you're saying and yes it can get really expensive, but they are trying to make it more affordable and accessible for a wider range of riders. 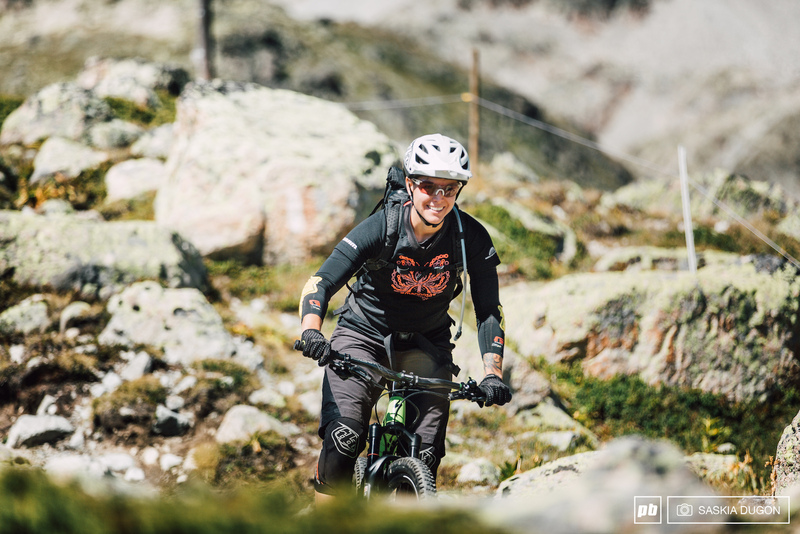 The good thing about St.Moritz is where it's situated, even if you spend a day or two here before heading to another location to ride (like Livigno for example) it can be very expensive, but you can make it what more affordable with special deals and camping, it can be an option, and honestly the trails are so worth it. @jmartinbiking: props to you for owning it. 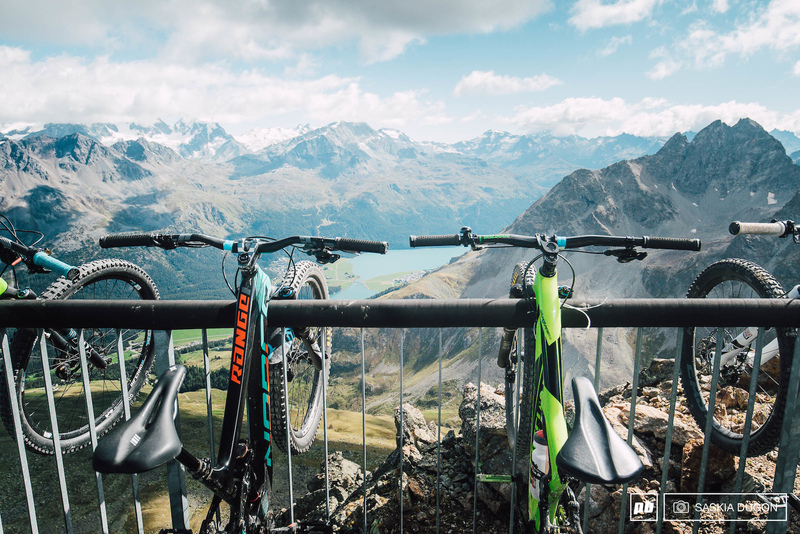 What's your favorite spot to ride in Switzerland? @jmartinbiking: Could you define middle class for us please? @squarewheel: Yeah sure, I was exaggerating... but you can have french wine for pretty much nothing (at least, compared to us). I think many people have flatted their tires on those rocks below Alp Grum! Good photos and the words capture the excitement too. Allegra! @laurenjenkins This looks like a wonderful trip to be part of. Stunning scenery. Did you travel with your bikes? I would be coming from the States if I were to do this, so I can imagine that would be a great expense if I brought my bike. Rental options? I need to make this happen. I tried to check in to bever lodge on the woman's week, but was told I couldn't as they had the decorators in. Nice write-up! Women congregating at the aptly named Beaver Lodge.......oh wait, it's Bever. Never mind. Engadin is pushing it this week. From Scuol (Lower Engadin) right up to the place to be for Dentists. How expensive is bever lodge? Spendy. But very, very, VERY nice. And their bike room was no less than impressive. More Information about the area and the opportunities you find on www.bikeschool-engadin.ch and www.herbert.bike! The cheapest pizza costs €25,-???? You can get a pizza margarita at Hotel Piz for for 12 CHF! I like riding with girls too!